She forgot his name! Did they make up the next morning in class or never quite get over the rocky start? It’s easy to picture the scene of fumbled embarrassment unfolding in the playground; an early encounter with rejection and the messy complexities of human relationships. Did the experience shape either of them? Has the boy hated Woody ever since? What happened on this day? The specificity of the time – 10 minutes past – speaks of hospital visits, dentist appoints and GP slots. (Most hairdressers aren’t open on a Monday.) The note has been written carefully, with precision and clarity. Not absent-mindedly folded in half or tucked in a back pocket, but more likely placed straight between the pages of a diary for safe keeping. Did the date loom? What secret miseries shaped this young writer’s 9-3 existence? Sent out into the world on a scrap of blue-lined paper torn from the back of an exercise book; was this bold statement a call for help? Does Brett remember writing it? Where is Brett now? Does she/he still look back on the school as a bad one? A shopping list that speaks of grandparents – the only generation that still eats Brussels and corned beef. A generation of milky, sugary tea drinkers that still sends letters in the post. A post-war generation that came before millennial ideas about ‘clean eating’. A note written by a hand stained by a life-long smoking habit. By a shaky, arthritic hand. A hand looking forward to patting the grandchildren on the head perhaps and serving them a plate of sausage beans in front of the TV. Did the shopper pick up sausages twice? The discarded list is dirty and crumpled, trodden on by countless shoppers and dusty from the supermarket floor where it lay amongst clumps of hair, balls of dust and bits of vegetable matter until artist Jack Brown bent down and rescued it from the flow of time. Like each of the notes presented in ‘Found Note Silk Hanky’ at PAPER, ‘220 Bensons’ has remained part of Brown’s collection ever since. A collection compiled over the course of 20 years – dating back to his early days at art school in London – and which now spans three scrap books, all bursting at the seams. Brown has always liked to collect things. As a young boy, he’d accompany his mother on trips to Stockport Precinct, diving under clothing rails to gather up the transparent plastic clips that hold garments in place on hangers, coming home with his pockets bulging. In his studio at Paradise Works in Salford, a museum display table is dotted with a lifetime’s assortment of bolts and screws found in the street, odd trinkets, battered toy cars, the employee name badge from his first job; all patiently waiting to form part of another project that he’s currently working on, dedicated to the seaside town of Barrow-in-Furness. Why did he decide to reproduce the paper notes on silk handkerchiefs? He’d originally experimented with paint; tenderly rendering each in copper, enamel and gloss. “But this turned them into ‘art objects’,” he reflects – a classification Brown deliberately tries to resist within his practice, preferring a ‘less grandiose’ quality, whilst simultaneously playing with the fine line between what can and can’t be consider ‘art’. The handkerchiefs were made using one of those websites that print personalised t-shirts and mugs. He likes his work to be ‘open source’ – actions that could be performed or replicated by anyone – a principle carried over from more than 20 years spent working in art education and as an advocate for art. (His call for collective creativity most explicitly comes through in his recent series of banners, Instructions for the public (where to put it) (2018), currently on show as part of ‘Represent! Voices 100 Years On’ at People’s History Museum). But why did he choose hankies from the drop-down menu of everyday items that he could have printed onto? 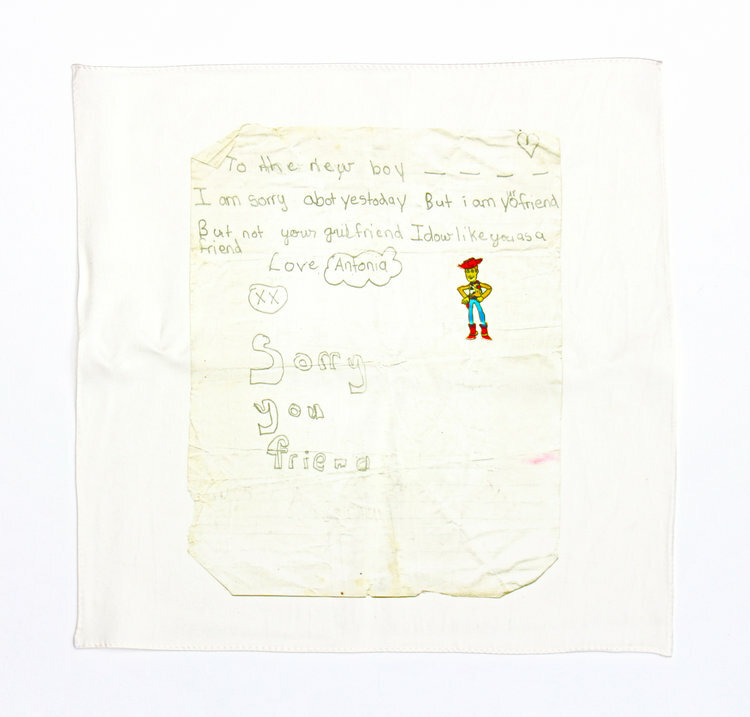 Handkerchiefs are anachronistic and redolent in association; they also get lost and forgotten about, just like loose bits of paper. “For me, and for other people, I think, they talk of aunties and grandmas, of intimate actions and personal history,” Brown explains. (For Brett and Antonia, they might also conjure memories of snotty school runs.) And silk? “It has a personal feel to it. More of a sense of craft – or the appearance of craft, at least, even though I didn’t make it.” The decision seems to convey a kind of love as well. A gesture of respect and care for these overlooked fragments of people’s lives, recorded on the back of pink betting slips and yellow Post-its. Snatches in time that Brown has become custodian of. There’s a beautiful simplicity to Brown’s work, or a ‘slightness’ as he describes it. A generosity in the attention he pays to the overlooked; to the stories that aren’t even stories. His decision to pick up and smooth out the discarded pieces of paper that others might treat as rubbish, and to present them delicately within a gallery space on crisp white canvases of silk, is an invitation to slow down. To notice the world around us and the quiet moments that fill it, unremarked. To pay attention. Previous Rosanne Robertson: Slipping. Suspended.